Around the time I met the folks from Lectron, I was having a few too many issues with the carb on my 2015 Suzuki DR650. Although the stock carb worked okay, its factory set-up was way too lean and laggy, and I could never seem to get it adjusted optimally—especially for high-altitude variations or heavy loads. I tried jetting kits and even a “pumper” carb, but the mods simply never ran right; it guzzled gas, required constant fiddling and was an ongoing drain on my wallet from the many failed attempts to get it tuned. All that misery ended when Lectron sent me one of their new high-performance Gen II* models to test. It came already set up—a direct plug ’n’ play bolt-on. What’s even more impressive is that it’s self-tuning and self-adjusting for variable conditions and altitudes and doesn’t require a mechanic to install. 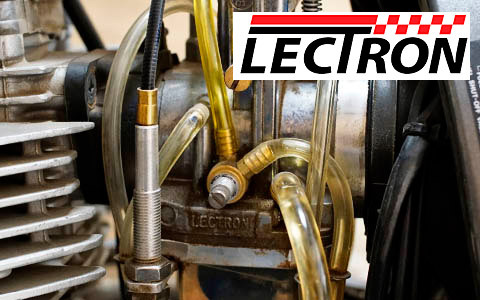 Think of the Lectron like adding the benefits of EFI to your carbureted bike. The Lectron is sold in kits for specific makes and models of bikes. The kit I received came with a quality throttle replacement cable*. A stock DR650 has the two-cable, push/pull style, and the Lectron requires only a single cable. And, on the DR650, the Lectron needs to be rotated approximately 10 degrees either port or starboard to accommodate the bike’s upper frame bar. Although there are three manual adjustments, you may never need to use them. So far, I haven’t. You also remove the original choke entirely; the Lectron has its own choke built directly on the unit (where I prefer it). During the installation I was fully expecting hours of tedious, fiddle this, adjust that, set-up. However, the only problem I experienced was my own anticipation (read: anxiety) of complexity. The install was a simple matter of replacing the throttle cable and swapping the original carb with the Lectron—about an hour with basic tools. And, as promised, I haven’t had to so much as turn a single adjustment screw. After months of messing around with jetting kits and untold other carb issues, I couldn’t believe how easy the upgrade was. If I had only known…. Immediately after the install I experienced some minor sticky throttle issues but quickly discovered that the Lectron required a couple of runtime hours to fully break in. After the unit’s internals were settled, the bike ran better than ever. Just looking at Lectron you can tell it’s a quality-made product. It’s an impressive piece of engineering, quite unlike the outmoded pot metal standard carbs we’re accustomed to. It’s also made with pride in Texas, another reason to appreciate this technology. What’s it like? I’m getting better gas mileage (~10–15%), the throttle response is MUCH smoother without lags or surges, and there’s more low- to mid-range power, which is especially noticeable under load. The folks at Lectron say that their carb automatically adjusts for altitude, temperature and humidity. Proof of this self-adjustability feature was demonstrated when I drove the Lectron-equipped DR from the scorching hot southern California desert floor directly up to a cool and rainy 8,500 feet in the nearby mountains without so much as a sputter or any power delivery problems. If for some reason an adjustment is necessary, there are two external screws that require only a quarter or half turn each, that’s it! And, there are no needles or jets to fiddle with; in fact, they’re history with the Lectron. Do I like the Lectron? Bottom line: without hesitation I give it Five Stars with a bullet! 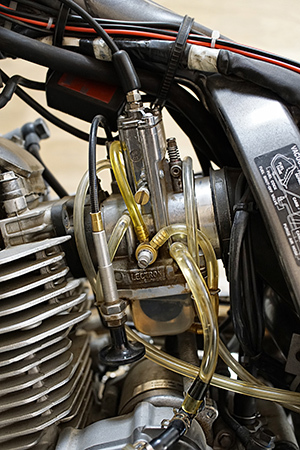 For standard carbureted bikes it’s a no-brainer to dump that dinosaur of a carby and swap it for Lectron’s innovative upgrade. *Available for several two- and four-stroke motorcycles. **On some installations you may need to purchase a separate throttle cable, which is readily available from our friends at Motion Pro. The folks at Lectron will let you know.